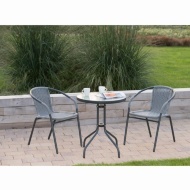 The set is a stunning rattan effect with double woven construction. Suitable for indoor and outdoor use, while cushions are also included. Image for illustration only. Product may vary slightly from that shown. Read instructions carefully before use.